Danish typeface designers e-Types have opened a shop for their type foundry in Copenhagen, Denmark, where customers can buy digital fonts in a physical space. Customers can buy fonts loaded on USB sticks at the shop as opposed to the online Playtype store where fonts are downloaded or sent by email. The shop also stocks posters, t-shirts and homeware decorated with letters designed by e-Types and their colleagues. Oversized fonts have been printed on the glazed storefront and on the walls inside. Merchandise is displayed on wooden tables, and the floor is tiled in black and white. The shop will be open for just one year. The world’s first brick and mortar type foundry. e‐Types launches concept store to celebrate the revamp of Playtype.com. 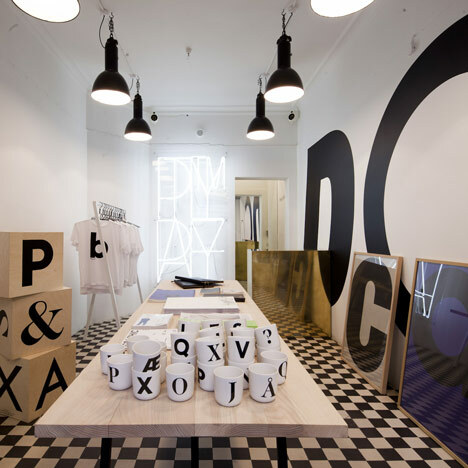 In connection with the redesign and launch of their online type foundry www.playtype.com, the Copenhagen‐based design agency e‐Types is launching a typographic concept store, "Playtype", located in the heart of Copenhagen, Denmark. "We ́ve always been type nerds. It’s what founded our company and what keeps the midnight oil burning at e‐Types, with people spending hours on the correct curvature of a "C" or the appropriate amount of space around an "A". Typography is essential to who we are as a firm but also for the work we do for our clients; much of a company's identity rests in its use of type. Just think of Coca Cola or IBM. Releasing our fonts like this is a way of signaling that we want to put Danish type design on the map" says Jonas Hecksher, Partner and Creative Director at e‐Types. Apart from selling fonts, the shop will feature a number of products and editions ‐ some designed by e‐Types, some in collaboration with friends and colleagues from the design and art world. "The offline shop is a way of starting a dialogue with a wider audience about the significance of typography, sure. But it is also a place where we can experiment with our craft. A place where our designers can work more freely than they normally would when working with a corporate design programme. The shop gives us a place where our designers can have a cool idea on a Monday and see it come to life in the shop the following week. For now, we’ve created a couple of t‐shirts and posters, but maybe we’ll transform the whole space into a gallery next month or something completely different the month after that. It's an experiment. A playground." comments Rasmus Ibfelt, Partner and Managing Director at e‐Types. The online shop Playtype.com will feature over 100 new fonts designed by e‐Types and longtime friends and partners, the prolific London‐based typographers A2/SW/HK run by Scott Williams and Henrik Kubel. The font collection is the culmination of over 20 years of type design, with many typefaces never having been publicly available till now. "Some of the fonts we are releasing were originally for clients and some are sketches and doodles that gradually have evolved into full‐blown type families. Some were inspired by a particular context – for example "Nouvel" which was inspired by Jean Nouvel's architecture for Koncerthuset, the new concert venue designed for the Danish Broadcasting Corporation. Others were designed to be purely functional and work under extreme circumstances ‐ like "Medic" that is designed for emergency medicine." says Jens Kajus, Partner and Creative Director and like many of the e‐Types team, a long‐ time contributor to the Playtype font collection. “Playtype.com is the perfect match for A2’s commercial fonts. Like e‐ Types, our studio has been crafting high‐end and versatile typefaces for many different kinds of clients for more than a decade. It is our hope that the expanding world of advertising, branding agencies and design studios across the globe will see this injection of fresh faces as a starting point for future communication.” says Henrik Kubel, Partner at A2/SW/HK. The shop in Copenhagen will open on December 1st 2010 and close exactly one year later on December 1st 2011. Playtype.com however, is here to stay.